On October 3rd-7th, 2016, we dedicated a full week to our colleagues from the Customer Service, to show them our appreciation and to demonstrate once again the importance of their work. All six centers in the country were eager to participate and so we managed to become even more close, to get to know each other better, and to learn from each other. One small town at the foothills of Făgăraș Mountains… 8 generations… 30 grades… 50 professors… 500 children… 1000 parents… 1500 of carnations … an infinite number of dreams and hopes. I will always remember my first day of school. It all started during the holidays, when my mum would tell me, before going to bed, how nice school will be. She told me that I would make a bunch of new friends and that I will discover the mystery of books, that I would learn to write and to do so many other things, which will be useful throughout my life. I nostalgically remember my first day of school. A quick breakfast which I gnarled, the meticulous ‘getting-ready’ with my new clothes, grabbing the small backpack and…ready…off to school: me, mum and dad. We were all nervous, small or grown up, with or without experience. On my way there, I am relieved to notice that I wasn’t the only one looking as a new freshman. I am actually proud of my outfit and supplies so I straighten my back, walking head high and gaze forward. My folks notice this and smile with approval. My mother gently strokes my head. Finally, we arrive at the school gate, invaded of children eager to reunite with their friends, to tell their holiday stories or – as for me – to see what it was like! Here we are, walking down the long corridors, gleaming clean. I walk meekly, and my courage melts like butter in the sun… I’m not so sure I want to stay here on my own, without my mum and dad, without my playground friends. Well! It is what it is! 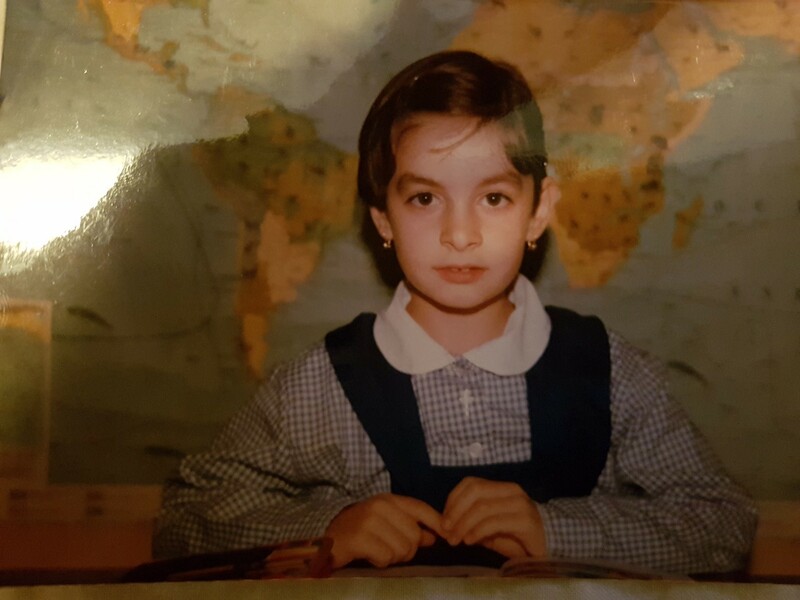 It’s time to look for my classroom, to take courage and sit in one of the white desks nicely arranged, with love, between the books and flowers … Here comes the teacher, with a smiling face, seeing all the surprised little eyes riveted on her. There you have it. I’m a pupil now so I have to see… what it’s like?! My first day of school… this is a full pack of memories, not a composition. This is a story from ’98, fresh in my memory, like it was yesterday. I’m still in the summer holiday. I am in Cluj, in the village of Sântioana. Somewhere inside I know it won’t be as easy as so far. No more playing! And still, I don’t understand why I get an alphabet book and a workbook. What should I do with them? I open them and I see pictures. But, somehow they look more beautiful than the ones from my coloring books. I will use them as a menu, later, when I will be pretending to own a restaurant or, why not, hold a market. Summer holiday is almost over. This is a late August evening and I look to my right, to the road. I see the fiery sky embracing a sunset, crying its desire to stay longer, instead of the cruel moon. Roasted corn was messing my teeth when I heard: ‘Your mother is coming from Braşov to take you home, in two days’. I was happy to hear that since I knew I would be back, behind the block, playing with my neighbors… fascinating. What puzzled me was why the bus would keep coming from Gherla with parents, kids, carrying school supplies. What should I do with them? Are they toys for older children? So, I’m in Brasov… walking into my room, on my bed, where I find an abacus, a set square, pencils, a backpack, a pen, an ink bottle, blotting paper, special notebook for Ist grade Communications, a workbook and… stop! an alphabet book. What is this intruder doing in my path, once again? I left it to the gee se in Sântioana. What is it doing here? I turn my gaze to the window and, hanging on the freshly painted wooden window handle, I find a uniform. – Muuuuuuuuum! What’s this ugly checkered piece of clothing doing here? – It’s your school uniform, my dear. Just like your outfit in kindergarten. I understand that something serious was about to happen. The big day is here. Today is September 14th. Not 15, cause that’s Tuesday. Now this is a big commotion. My dad went to the market to buy flowers, my mother is ironing that hideous uniform. I’m off the hook this time, with the promise that I will wear it the next day. It’s time for us to go to school together. It’s close to home, next to the kindergarten. It is school no. 22. I go into the big building and my mother tells me, looking at the panel of school elites, ‘Here’s where I want to see you in the fourth grade.’ So here I am, in the classroom. As daring as I am, I sit in a desk. What an ugly table, with a desk, with pen scribbles. What do I see? The blackboard said ‘Welcome to school! You are the hopes of tomorrow!’. Our teacher urges us to say, in unison, ‘ Gooood moooorniiiing, teeeeeacheeer!’ I look at my parents and I notice their eyes are watery. Mum is holding a couple of red carnations and looks at me kindly. The teacher says we are about to start a journey together. It will last 8 years, of which 4 will be without her, madam Drăgan. What a kind woman! I’m beginning to like it here! There are books on our desks. The teacher says we have to take care of them, to put covers and labels on them. Now it’s time to get to know each other, by introducing ourselves. This is the time when I realize I can find a bunch of friends! We all stepped into the school yard, one by one, and the principal had a speech for us, freshmen. I like going to school! Now I’m going back home, feeling emotional, joyful, eager to return tomorrow! Looking back to that day, I realize it’s been 18 years. What appeared to be an impressible commotion then, now it seems to be one of my best memories. I miss reliving those memories with my child who, most certainly, will study the primary school where I did. I miss the school, the teacher, the breaks and my colleagues. The first day of school? Quite a while has passed since. I remember how, before starting school, I went shopping with my parents and, in addition to the tens of notebooks, pens and whatever stationary items I needed, my beloved parents bought me a suit. Of course my mummy wanted it to be something casual, but, since I was also there, I saw a cherry jacket and I feel in love. That jacket was part of an event suit: it had a bow-tie, a handkerchief and a matching belt and to me, as a child, it was breath-taking, and my parents had to buy it. I was loving that piece of clothing so much that I slept in that jacket and I remember now, being grateful to my mother, that she had to iron it again, the next day. I left to school, all dressed-up, with a backpack twice my size and a gigantic flower bouquet. I had a huge smile on my face and I was more than thrilled. Most of my colleagues where ‘old friends’ of mine, the beautiful group I had from kindergarten till the end of eighth grade. The teacher was just like a fairy for us and, once again, when we met her, it was love at first sight. I was a hard-working student and I am still a student who strives but, looking nostalgically behind, I realize that memories and past times will never come back, maybe only when, in my turn, I will take my kid to school, for the first time. That’s why I love this job. The team here still gives me the feeling of a classroom where you find all the stereotypes of students: the hardworking one, the geek, the beautiful and smart girl, the loose-tongued, rogue and so on. We all want to graduate from this CGS Romania ‘grade’ and each one of us has career plans. Our ambition, at least for ‘the Brașov gang’, is our strong point and we are certainly the ‘Olympians’ of this great brand called CGS. These memories are as vivid as my memories from the first day of ‘school’ at CGS. When I started the training, I felt like the most insignificant there. I believe I was the only one who didn’t know how to at least install a program and I was horrified to ask what was next. And, luckily, as it happened in school, step by step I got the hang of it and to gain experience. There are still plenty of things to learn, but I am now happy for this. September 15th, 2001, 8:30 A.M.. Good morning! I hadn’t slept all night because of the nerves. This is my first day of school. I’m going to become a full-fledged school girl. It was like the most desired moment had arrived for my family. My parents and grandparents were nervous, and they seemed to convey this state of mind to me. I had no idea what was going to happen but I realized it would be colossal, considering the reactions of those around me. Once we arrived in the school yard, I almost felt dizzy because of the crowd. All of a sudden I realized that this day wasn’t all about me. The attention, the preparations, the nerves, the hugs my parents and grandparents gave me no longer made me feel that special and important. There were so many pupils there… I felt like an ordinary kid. Other girls also had a uniform and braids. Some of them even had nicer hair clips than mine. Where did they buy them? I wasn’t saying anything. I was surrounded by a wall of people taller than me. I see Ana, a friend whom I played with the entire summer. I wanted to talked to her and to tell her ‘Look at me, Ana! I am also in school now’; but she is older, hanging out with her colleagues. She ignores me, pretending she didn’t notice me. ‘Never mind!’, I keep telling myself. I will play with her later’. I hear the bell. Mum tells me we need to go to the classroom. I sat in the first desk, being pushed from the back, by my mother. The classroom was empty, with white cold walls. Handbooks were sitting alone on the desks, with red covers. This velvet material was attached to the desk with a white elastic. I move over the case and I discover the old and scribbled. I wonder how many kids have sat here before? I saw letters, such as A+I = LOVE (I could read capitals). Ashamed, I slowly put the case back and I notice a flower next to my handbooks. I peep at my desk mate and I notice that she also has a flower. We all had. The classroom had a new and pleasant scent, of which I was also afraid. All of a sudden I hear a kind, warm and nervous voice. My teacher introduced herself and I went to give her the flowers, with my knees shaking and cheeks burning. She smiled shyly and reminded me of my mother. She seems to be a nice person. ‘I hope she will never punish me’, I tell myself. Afterward, I left for home, happy and anxious to return. Since I couldn’t wait to return the next day, for several minutes, I kept sniffing the fresh ink from the handbooks I received. As a pupil, I was always a clever kid… or, at least, this is what I wanted to believe. So, when going to the Ist grade, I had to take a test, since I wasn’t seven years old yet. If I scored 80%, I went to the Ist grade, but if I scored less, this meant another year in kindergarten. Since I was stubborn from a young age, I wanted a new level, so I got 100% – intelligence confirmed. Happy, as any kid when receiving a new toy, wearing my uniform and holding a flower bouquet, as a ‘standard pack’ for the young ones, I went to school. I sit quietly at my desk and I wait for the attendance check: ‘“Mărăcine – present. Manea – present. Păducel – present.’…when hearing that word, all eyes turned on the first desk- over it, seeing a hand raised, up to the elbow, and two eyes. Oh… I forgot to mention… I was ‘just a bit over 1 meter’. You couldn’t even see my hand when sitting at the desk. And so I went from going up the stairs in my knees – kindergarten, to the next level: 2 pillows under my bottom – Ist grade. Cause I grew up a bit. I will be able to do them all! I am a first grader! My first day at CGS Academy was very interesting. I had very weird nerves. First of all, I was very nervous, because I didn’t know what to expect. I thought training would be hard and that I wouldn’t be able to learn. Secondly, I was nervous because I knew the most difficult thing for me was to talk to strangers. The most interesting thing happened when I finished my training and we had the chance to hear our more experiences colleagues, to hear them how they talk to the clients. Then, looking at the monitor, I saw a very complicated system. But now, after 2 months, I can say that I enjoy working with it. It is even easier than I thought. I hope that, from now on, I will get many beautiful experiences working at CGS. 6:15 I almost left in my PJs, looking for flowers, from my neighbors. 6:45 Jumping into the shower, with jellyfish hair, I went to the kitchen, (confirmed theory, bread always lands butter and jam side-down. Still, the cat doesn’t always appreciate my fruity adventures). 7:00 Forgot iron on my shirt. 7:15 Who needs shirts? Nirvana T-shirt it is. 7:30 Make-up symmetry even less important. 7:45 Headphone wire clings to the door, now I must shake my head and murmur when asked something. 8:00 The minibus operates on another time zone. 8:30 At the high-school gate, people are too cheerful, colorful and talkative. This is gonna be just peachy.